Previously I talked about Google Latitude and how you can see the location of your friends using GPS (if available) or estimates using cell phone towers. 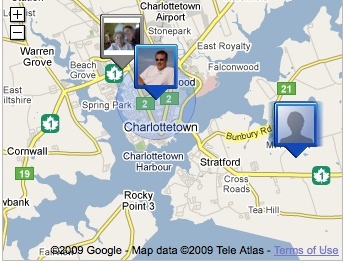 Something I did not mention before was Google does give you some privacy when using Latitude. You can allow your phone to automatically detect your location, or you can set your location manually or just hide where you are. Latitude isn't usually exact (as you can see with the blue shaded in area on my Latitude example above) but it really depends on where you are and what phone you are using. None the less, it gives you a pretty good idea as to where the people are. The three people I have on Latitude all have the same Blackberry Curve through either Bell or Telus so it typically gives a range within a kilometer or 2 or 3 of where they are. Last week on a trip down to Montague Latitude was showing exactly where we were because there is less obstructions blocking my Blackberry from reaching the GPS satellites. None the less Latitude is perfect for companies who need to have an idea as to where their people are. In my situation the two other people on my latitude are actually from Halifax and Vancouver however they are home for a couple days so it is showing them in town. On my HTC Dream (with Google Android) which I am reviewing for Roger's, it can narrow it down to within 1-2 meters, inside or outside, as I previously Tweeted about.